Today I woke up at 5:30 in order to make the 1.5-hour trip to Cadiz City before the first center meeting. The bus passes by 100 or so kilometers of sugar cane farms and fields. The loan officers arrive at the branch around 8 AM. There will be 14 center meetings led by 7 loan officers. Each loan officer is in charge of 1-3 meetings per day, depending on the proximity and size of the centers, which range from 6 to 85 members. This morning, all the loan officers are heads-down, calculating the day’s payments from the clients. It is important that this work is done ahead of time, as promptness and efficiency are a virtue when you are trying to meet with upwards of 100 clients per day. Bantayan. I am heading there for vacation in February. Today I am traveling with Patch (short for Pachito), a former loan officer at the Bantayan branch north of Cebu. He started with Project Dungganon about 7 years ago, spending two years as a loan officer before moving to the head office to work as a trainer for new officers. For five years, he ran workshops and on-the-job trainings for the fresh blood of NWTF, helping them to bring out the best in their recruits. For the last 6 months, he has been working on the Kiva project, helping to write the borrower profiles that you see on the website. It’s not hard to see that Patch feels right at home with the other loan officers here. We have come to Cadiz to do journals, a requirement of all MFIs working with Kiva. We meet up with as many Kiva clients as possible to interview them about the status of their loan, which we then write up in story format and send to each of the people the funded the loan. Today we are splitting up to cover as much ground as possible. I will be traveling to two center meetings with Karen, a young loan officer with a commanding knowledge of English. She has a one-year old son at home, and a husband that is watching after the family until he heads back to Bahrain for work. We take a tricycle out to the center meeting, where she will collect the repayments while I meet with one of the Kiva clients who is a member of the center. I meet with Arlene, a friendly owner of a sari-sari store with 3 children and one grandson. She speaks English better than any client I’ve met, which is a pleasant surprise. She invites me into her home to conduct the interview, inviting me for snacks afterwards. Over a Mountain Dew and some crackers, she gives me a tour of her house and shows me pictures of her family in Boracay (an island in the Philippines). Her husband works in Manila for most of the year, performing maintenance on heavy machinery at construction sites. 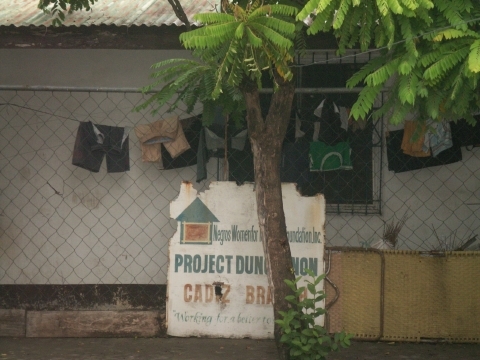 He used to live at the house, helping with the businesses and driving one of their jeepneys. Unfortunately, they sold the jeepney after getting into an accident. Then Arlene got sick, and her husband had to leave to find work in Manila to pay for her medication. After an hour of discussion, she gives me three mangoes from her tree to take with me, and Karen and I leave for lunch. Karen and I eat at Mang Inasal, which faithful readers of this blog know well. We discuss why there are so many Mormon missionaries in the Philippines and whether she likes her in-laws before heading back to the branch. We are only there for 5 minutes before heading out again to meet with two more Kiva clients and talk to them about their business. Cadiz is a big fishing town, so a lot of women have businesses drying fish and selling them in the market. One woman also sells seahorses to a Taiwanese buyer who exports them for sale in medicine. I ask her what seahorses cure, but she didn’t know. We head back to the branch, meet Patch, who has met 6 clients today, and head for the bus, where I sleep for the hour and half drive back. Tomorrow I’ll spend the day in the office, and head back to Cadiz on Wednesday to meet with another 5 Kiva clients. The rest of the day is run-of-the-mill – studying Illonggo, sifting through the black hole that is the Philippine government statistics office, and hopefully play some pick-up soccer with some Filipinos that meet in an abandoned gym every Monday and Wednesday. 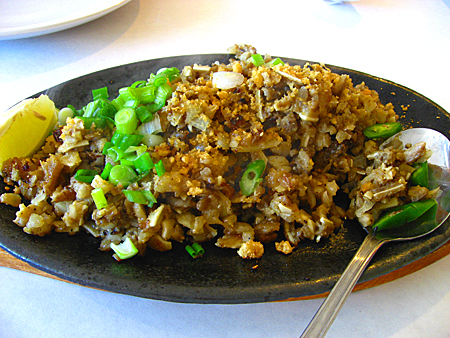 I ate sisig for dinner – it is a tasty dish of fish or pork mixed with vegetables, vinegar, lemon juice, and other things. A plate of sisig, a side of rice, a beer, and a bottled water cost me about $3.75. Cheap living. This is an example of what everyday life is like here. Sorry for not teaching anything about the Philippines or microfinance. I will try harder in the future. Wow, sounds really interesting. Glad to get a glimpse in to the routine.